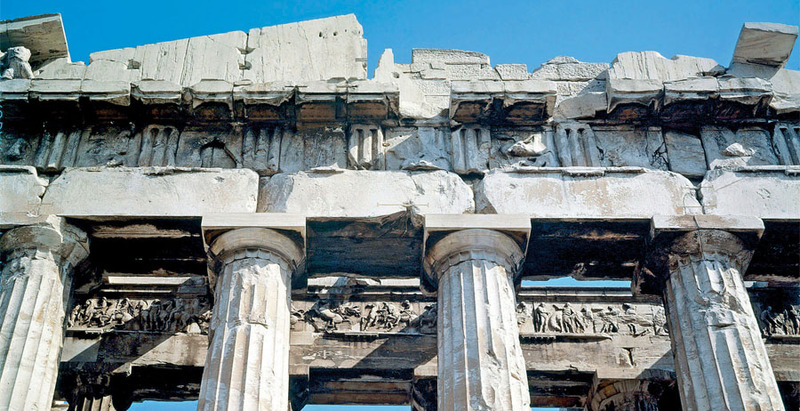 In architecture, the Greek achievement has been identified since ancient Roman times with the creation of the three classical architectural orders: Doric, Ionic, and Corinthian. Actually, there are only two, the Corinthian being a variant of the Ionic. The Doric (so named because its home is a region of the Greek mainland) may well claim to be the basic order, since it is older and more sharply defined than the Ionic, which developed on the Aegean Islands and the coast of Asia Minor. What do we mean by "architectural order"? By common agreement, the term is used only for Greek architecture (and its descendants); and rightly so, for none of the other architectural systems known to us produced anything like it. Perhaps the simplest way to make clear the unique character of the Greek orders is this: there is no such thing as "the Egyptian temple" or "the Gothic church." The individual buildings, however much they may have in common, are so varied that we cannot distill a generalized type from them. But "the Doric temple" is a real entity that inevitably forms in our minds as we examine the monuments themselves. We must be careful, of course, not to think of this abstraction as an ideal that permits us to measure the degree of perfection of any given Doric temple. It simply means that the elements of which a Doric temple is composed are extraordinarily constant in number, in kind, and in their relation to one another. As a result of this narrowly circumscribed repertory of forms, Doric temples all belong to the same clearly recognizable family, just as the Kouros statues do. And like the Kouros statues, they show an internal consistency, a mutual adjustment of parts, that gives them a unique quality of wholeness and organic unity. 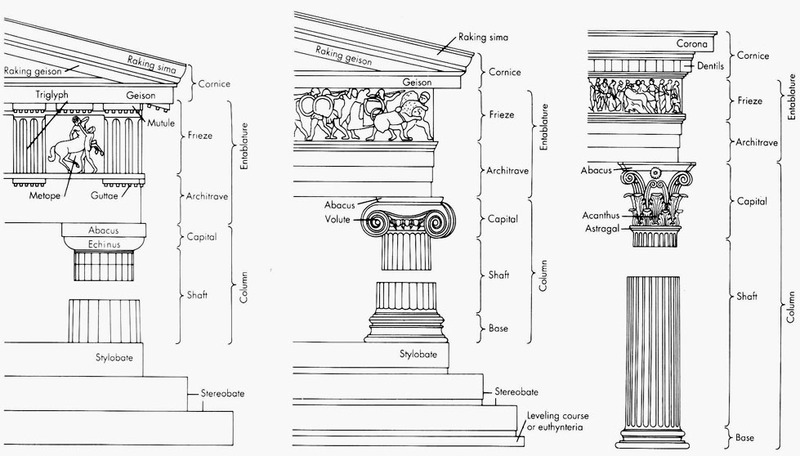 The term Doric order refers to the standard parts, and their sequence, constituting the exterior of any Doric temple. Its general outlines are already familiar to us from the facade of the Temple of Artemis at Corfu (fig. 158). The diagram in figure 165 shows it in detail, along with names of all the parts. To the nonspecialist, the detailed terminology may seem something of a nuisance. Yet a good many of these terms have become part of our general architectural vocabulary, to remind us of the fact that analytical thinking, in architecture as in countless other fields, originated with the Greeks. Let us first look at the three main divisions: the stepped platform, the columns, and the entablature (which includes everything that rests on the columns). The Doric column consists of the shaft, marked by shallow vertical grooves known as flutes, and the capital, which is made up of the flaring, cushionlike echinus and a square tablet called the abacus. The entablature is the most complex of the three major units. It is subdivided into the architrave (a series of stone blocks directly supported by the columns), the frieze with its triglyphs and metopes, and the projecting cornice. On the long sides of the temple, the cornice is horizontal, while on the short sides (the facades), it is split open in such a way as to enclose the pediment between its upper and lower parts. The entire structure is built of stone blocks fitted together without mortar. They had to be shaped with extreme precision to achieve smooth joints. Where necessary, they were fastened together by means of metal dowels or clamps. Columns, with very rare exceptions, are composed of sections, called drums (clearly visible in fig. 168). The roof consisted of terracotta tiles supported by wooden rafters, and wooden beams were used for the ceiling, so that the threat of fire was constant. The plans of Greek temples are not directly linked to the orders (which, as we have seen, concern the elevation only). They may vary according to the size of the building or regional preferences, but their basic features are so much alike that it is useful to study them from a generalized "typical" plan (fig. 166). The nucleus is the cella or naos (the room in which the image of the deity is placed) and the porch (pronaos) with its two columns flanked by pilasters (antae). 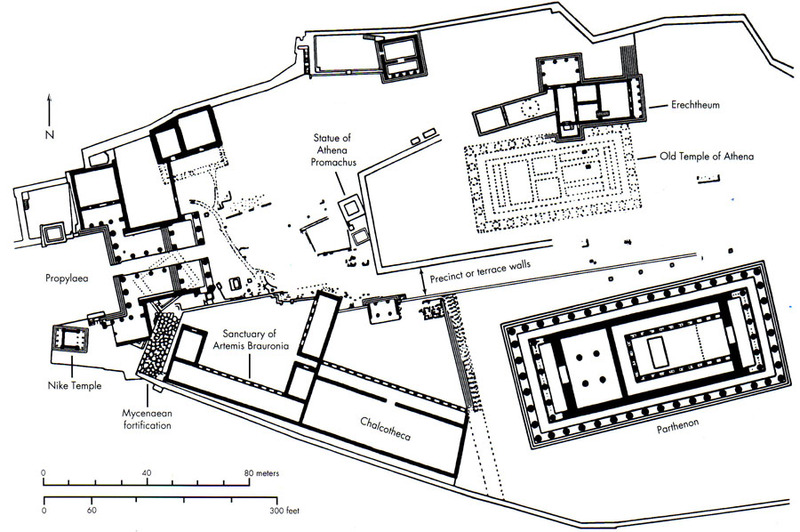 The Siphnian Treasury shows this minimal plan (see fig. 159). Often we find a second porch added behind the cella, to make the design more symmetrical. In the larger temples, this central unit is surrounded by a colonnade, called the peristyle, and the structure is then known as peripteral. 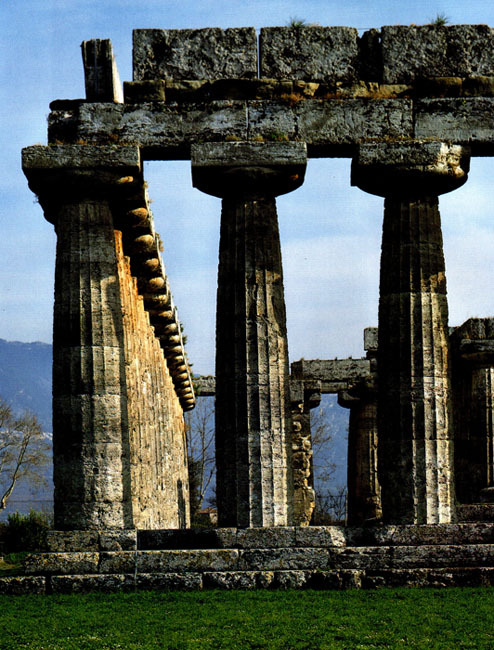 The very largest temples of Ionian Greece may even have a double colonnade. How did the Doric originate? What factors shaped the rigid and precise vocabulary of the Doric order? These fascinating questions have occupied archaeologists for many years, but even now they can be answered only in part, for we have hardly any remains from the time when the system was still in process of formation. The earliest stone temples known to us, such as that of Artemis at Corfu, show that the essential features of the Doric order were already well established soon after 600 B.C. How these features developed, individually and in combination, why they congealed into a system as rapidly as they seem to have done, remains a puzzle to which we have few reliable clues. The early Greek builders in stone apparently drew upon three distinct sources of inspiration: Egypt, Mycenae, and pre-Archaic Greek architecture in wood and mud brick. The Mycenaean contribution is the most tangible, although probably not the most important, of these. 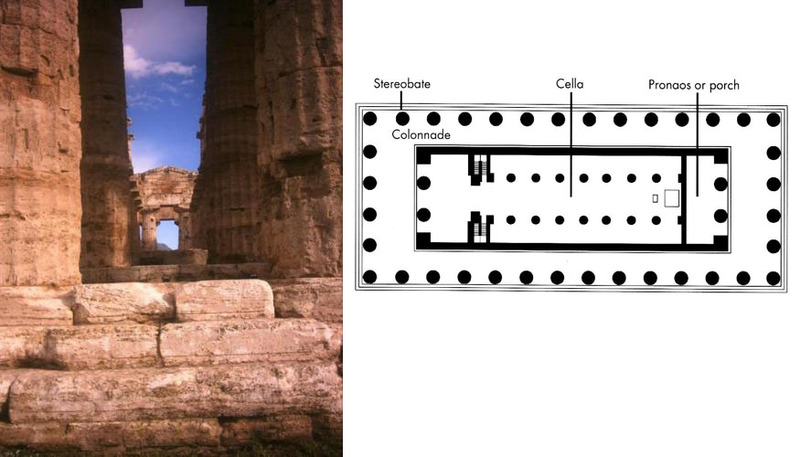 The central unit of the Greek temple, the cella and porch, clearly derives from the megaron (see fig. 138), either through a continuous tradition or byway of revival. There is something oddly symbolic about the fact that the Mycenaean royal hall should have been converted into the dwelling place of the Greek gods. The entire Mycenaean era had become part of Greek mythology, as attested by the Homeric epics, and the walls of the Mycenaean fortresses were believed to be the work of mythical giants, the Cyclopes. The religious awe the Greeks felt before these remains also helps us to understand the relationship between the Lion Gate relief at Mycenae and the sculptured pediments on Doric temples. Finally, the flaring, cushionlike capital of the Minoan-Mycenaean column is a good deal closer to the Doric echinus and abacus than is any Egyptian capital. The shaft of the Doric column, on the other hand, tapers upward, not downward as does the Minoan-Mycenaean column, and this definitely points to Egyptian influence. Perhaps we will recall now�with some surprise�the fluted columns (or rather half-columns) in the funerary district of Zoser at Saqqara (see fig. 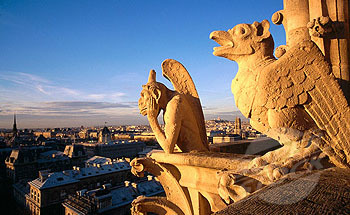 58) that had approximated the Doric shaft more than 2,000 years before its appearance in Greece. Moreover, the very notion that temples ought to be built of stone, and that they required large numbers of columns, must have come from Egypt. It is true, of course, that the Egyptian temple is designed to be experienced from the inside, while the Greek temple is arranged so that the impressive exterior matters most. (Few people were allowed to enter the dimly lit cella, and religious ceremonies usually took place at altars erected out-of-doors, with the temple facade as a backdrop.) A peripteral temple might be interpreted as the columned court of an Egyptian sanctuary turned inside-out. The Greeks also must have acquired much of their stonecutting and masonry techniques from the Egyptians, along with architectural ornament and the knowledge of geometry needed in order to lay out temples and to fit the parts together. Yet we cannot say just how they went about all this, or exactly what they took over, technically and artistically, although there can be little doubt that they owed more to the Egyptians than to the Minoans or the Mycenaeans. The problem of origins becomes acute when we consider a third factor: to what extent can the Doric order be understood as a reflection of wooden structures. Those historians of architecture who believe that form follows function�that an architectural form will inevitably reflect the purpose for which it was devised� have pursued this line of approach at great length, especially in trying to explain the details of the entablature. Up to a point, their arguments are convincing. It seems plausible to assume that at one time the triglyphs did mask the ends of wooden beams, and that the droplike shapes below, called guttae (see fig. 165), are the descendants of wooden pegs. The peculiar vertical subdivisions of the triglyphs are perhaps a bit more difficult to accept as an echo of three half-round logs. And when we come to the flirtings of the column, our doubts continue to rise. Were they really developed from adz marks on a tree trunk, or did the Greeks take them over ready-made from the "proto-Doric'' stone columns of Egypt? As a further test of the functional theory, we would have to ask how the Egyptians came to put flutes in their columns. They, too, after all, had once had to translate architectural forms from impermanent materials into stone. Perhaps it was they who turned adz marks into flutes? But the predynastic Egyptians had so little timber that they seem to have used it only tor ceilings. The rest of their buildings consisted of mud brick, fortified by bundles of reeds. And since the proto-Doric columns at Saqqara are not free-standing but are attached to walls, their flutings might represent a sort of abstract echo of bundles of reeds. (There are also columns at Saqqara with convex rather than concave flutes that come a good deal closer to the notion of a bundle of thin staves.) On the other hand, the Egyptians may have developed the habit of fluting without reference to any earlier building techniques at all. Perhaps they found it an effective way to disguise the horizontal joints between the drums and to stress the continuity of the shaft as a vertical unit. Even the Greeks did not flute the shafts of their columns drum by drum, but waited until the entire column was assembled and in position. Be that as it may, fluting certainly enhances the expressive character of the column. A fluted shaft looks stronger, more energetic and resilient, than a smooth one. This, rather than its manner of origin, surely accounts for the persistence of the habit. Why then did we enter at such length into an argument that seems at best inconclusive? Mainly in order to suggest the complexity, as well as the limitations, of the technological approach to problems of architectural form. The question, always a thorny one, of how far stylistic features can be explained on a functional basis will face us again and again. Obviously, the history of architecture cannot be fully understood if we view it only as an evolution of style in the abstract, without considering the actual purposes of building or its technological basis. But we must likewise be prepared to accept the purely aesthetic impulse as a motivating force. At the very start, Doric architects certainly imitated in stone some features of wooden temples, if only because these features were deemed necessary in order to identify a building as a temple. When they enshrined them in the Doric order, however, they did not do so from blind conservatism or force of habit, but because the wooden forms had by now been so thoroughly transformed that they were an organic part of the stone structure. 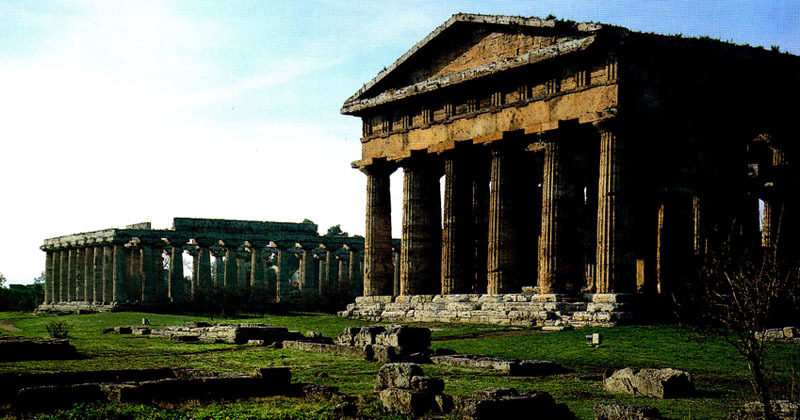 We must confront the problem of function once more when we consider the best-preserved sixth-century Doric temple, the so-called "Basilica" at Paestum in southern Italy (fig. 167, left; fig. 168), in relation to its neighbor, the so-called "Temple of Poseidon" (fig. 167, right), which was built almost a century later. Both are Doric, but we at once note striking differences in their proportions. The "Basilica" seems low and sprawling (and not only because so much of the entablature is missing), while the "Temple of Poseidon" looks tall and compact. Even the columns themselves are different. Those of the older temple taper far more emphatically, their capitals are larger and more flaring. Why the difference? 168. Corner of the "Basilica," Paestum. �. 550 B.C. The peculiar shape of the columns of the "Basilica" (peculiar, that is, compared to fifth-century Doric) has been explained as being due to overcompensation. The architect, not yet fully familiar with the properties of stone as compared with wood, exaggerated the taper of the shaft for greater stability and enlarged the capitals so as to narrow the gaps to be spanned by the blocks of the architrave. Maybe so, but if we accept this interpretation in itself as sufficient to account for the design of these Archaic columns, do we not judge them by the standards of a later age? To label them primitive or awkward would be to disregard the particular expressive effect that is theirs and theirs alone. The "Basilica's" columns seem to be more burdened by their load than those of the "Temple of Poseidon," so that the contrast between the supporting and supported members of the order is dramatized rather than harmoniously balanced, as it is in the later building. Various factors contribute to this impression. The echinus of the "Basilica's" capitals is not only larger than its counterpart in the "Temple of Poseidon," it also seems more elastic and hence more distended by the weight it carries, almost as if it were made of rubber. And the shafts not only show a more pronounced taper but also a particularly strong bulge or curve along the line of taper, so that they, too, convey a sense of elasticity and compression compared with the rigidly geometric blocks of the entablature. This curve, called entasis, is a basic feature of the Doric column. Although it may be very slight, it endows the shaft with a muscular quality unknown in Egyptian or Minoan-Mycenaean columns. 169. Interior, "Temple of Poseidon." Paestum. c. 460 B.C. 170. 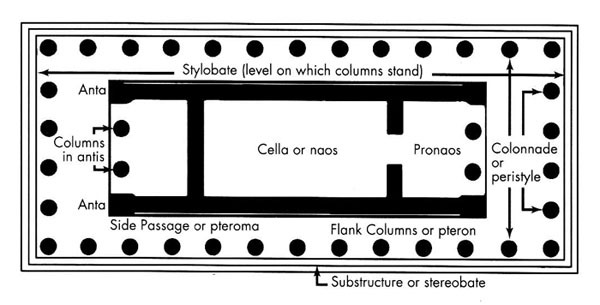 Plan of the "Temple of Poseidon"
The "Temple of Poseidon" (figs. 167, 169, and 170)�it was probably dedicated to Hera�is among the best preserved of all Doric sanctuaries. Of special interest are the interior supports of the cella ceiling (fig. 169), two rows of columns, each supporting a smaller set of columns in a way that makes the tapering seem continuous despite the architrave in between. Such a two-story interior became a practical necessity for the cellas of the larger Doric temples. 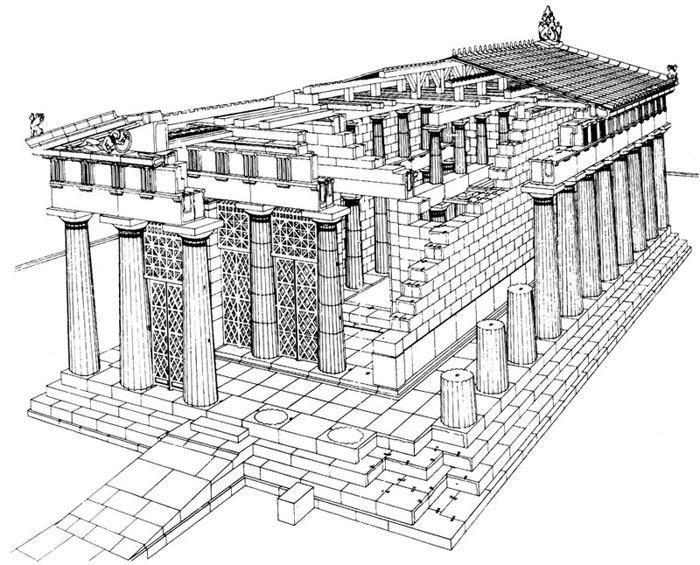 It is first found at the Temple of Aphaia at Aegina around the beginning of the fifth century, shown here in a reconstruction drawing to illustrate its construction scheme (fig. 171). ATHENS, PERICLES, AND THE PARTHENON. In 480 B.C., shortly before their defeat, the Persians had destroyed the temple and statues on the Acropolis, the sacred hill above Athens which had been a fortified site since Mycenaean times. (For modem archaeologists, this disaster has turned out to be a blessing in disguise, since the debris, which was subsequently used as fill, has yielded many fine Archaic pieces, such as those in figures 152, 153, 155, and 156, which would hardly have survived otherwise.) The rebuilding of the Acropolis under the leadership of Pericles during the later fifth century, when Athens was at the height of its power, was the most ambitious enterprise in the history of Greek architecture, as well as its artistic climax. Individually and collectively, these structures represent the Classical phase of Greek art in full maturity. The inspiration for such a complex can have come only from Egypt. So must Pericles' idea of treating it as a vast public works project, for which he spared no expense. 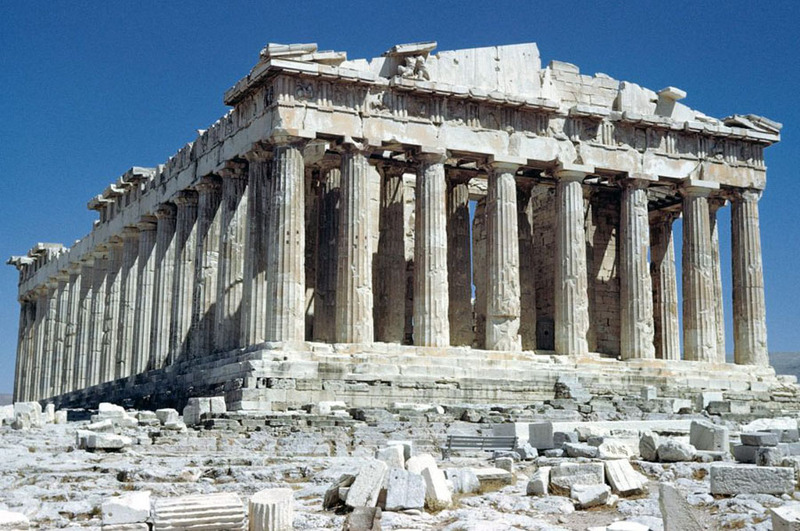 The greatest temple, and the only one to be completed before the Peloponnesian War (431-404 B.C. ), is the Parthenon (figs. 172 and 173). dedicated to the virginal Athena, the patron deity in whose honor Athens was named. Built of marble on the most prominent site along the southern flank of the Acropolis, it dominates the city and the surrounding countryside, a brilliant landmark against the backdrop of mountains to the north. 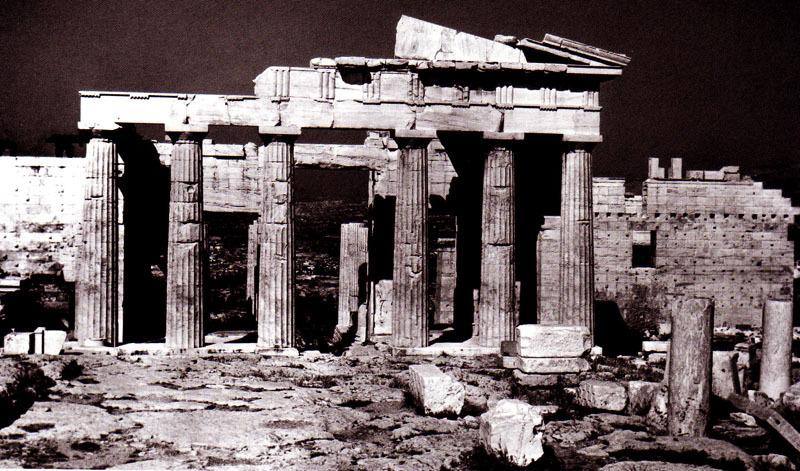 The history of the Parthenon is as extraordinary as its artistic significance. It is the only sanctuary we know that has served four different faiths in succession. The architects Ictinus, Callicrates, and Karpion erected it between 448 and 432 B.C., an amazingly brief span of time for a project of this size. 172. ICTINUS, CALLICRATES and KARPION. 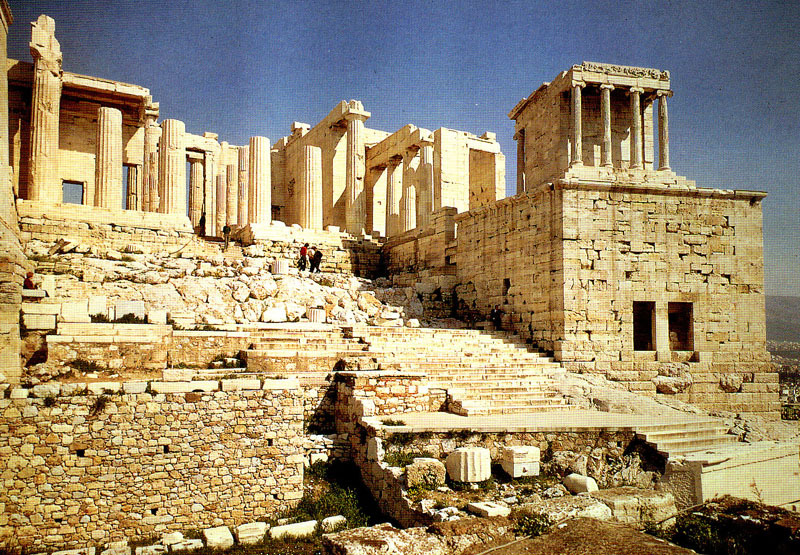 The Parthenon (view from the west), Acropolis, Athens. 448-432 B.C. In order to meet the huge expense of building the largest and most lavish temple on the Greek mainland, Pericles delved into funds collected from states allied with Athens for mutual defense against the Persians. He may have felt that the danger was no longer a real one. and that Athens, the chief victim and victor at the climax of the Persian wars in 480-478 B.C., was justified in using the money to rebuild what the Persians had destroyed. His act ciid weaken the position of Athens, however, and contributed to the disastrous outcome of the Peloponnesian War. (Thucydides openly reproached him for adorning the city "like a harlot with precious stones, statues, and temples costing a thousand talents.") In Christian times, the Virgin Mary displaced the virginal Athena: the Parthenon became first a Byzantine church, then a Catholic cathedral. Finally, under the Turks, it was a mosque. It has been a ruin since 1687, when a store of gunpowder the Turks had put into the cella exploded during a siege. 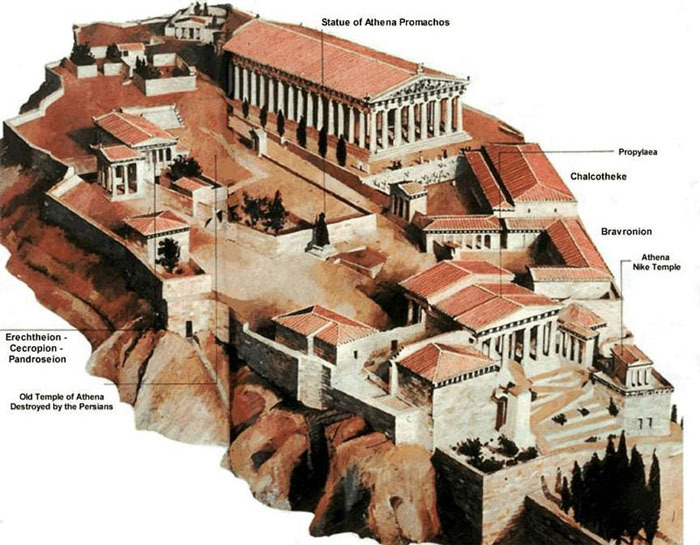 The Parthenon is unconventional in plan (see fig. 174). The cella is unusually wide and somewhat shorter than in other temples, so as to accommodate a second room behind it. The pronaos and its counterpart at the western end have almost disappeared, but there is an extra row of columns in front of either entrance. The architrave above these columns is more Ionic than Doric, since it has no triglyphs and metopes but a continuous sculptured frieze that encircles the entire cella (fig. 173). As the perfect embodiment of Classical Doric architecture, the Parthenon makes an instructive contrast with the "Temple of Poseidon" (fig. 167). Despite its greater size, it seems far less massive. Rather, the dominant impression it creates is one of festive, balanced grace within the austere scheme of the Doric order. This has been achieved by a general lightening and readjustment of the proportions. The entablature is lower in relation to its width and to the height of the columns, and the cornice projects less. The columns themselves are a good deal more slender, their tapering and entasis less pronounced, and the capitals smaller and less flaring; yet the spacing of the columns has become wider. We might say that the load carried by the columns has decreased, and consequently the supports can fulfill their task with a new sense of ease. These so-called refinements, intentional departures from the strict geometric regularity of the design for aesthetic reasons, are another feature of the Classical Doric style that can be observed in the Parthenon better than anywhere else. Thus the stepped platform and the entablature are not absolutely straight but slightly curved, so that the center is a bit higher than the ends; the columns lean inward; the interval between the comer column and its neighbors is smaller than the standard interval adopted for the colonnade as a whole; and every capital of the colonnade is slightly distorted to fit the curving architrave. A great deal has been written about these deviations from mechanical exactitude. That they are planned rather than accidental is beyond doubt, but why did the architects go to the enormous trouble of carrying them through, since they are not a matter of necessity? They used to be regarded as optical corrections designed to produce the illusion of absolutely straight horizontals and verticals. Unfortunately, this functional explanation does not work. If it did, we should be unable to perceive the deviations except by careful measurement. Yet the fact is that, though unobtrusive, they are visible to the naked eye, even in photographs such as our figure 172. Moreover, in temples that do not have these refinements, the columns do not give the appearance of leaning outward, nor do the horizontal lines look "dished." Plainly, then, the deviations were built into the Parthenon because they were thought to add to its beauty. They are a positive element that is meant to be noticed. And they do indeed contribute, in ways that are hard to define, to the integral, harmonious quality of the structure. These intentional departures from strict geometric regularity give us visual reassurance that the points of greatest stress are supported and provided with a counterstress as well. 175. MNESICLES. The Propylaea (view from the east). Acropolis. Athens. 437-432 B.C. Immediately after the completion of the Parthenon, Pericles commissioned another splendid and expensive edifice, the monumental entry gate at the western end of the Acropolis, called the Propylaea (see plan, fig. 174). It was begun in 437 B.C. under the architect Mnesicles, who completed the main part in five years; the remainder had to be abandoned because of the Peloponnesian War. 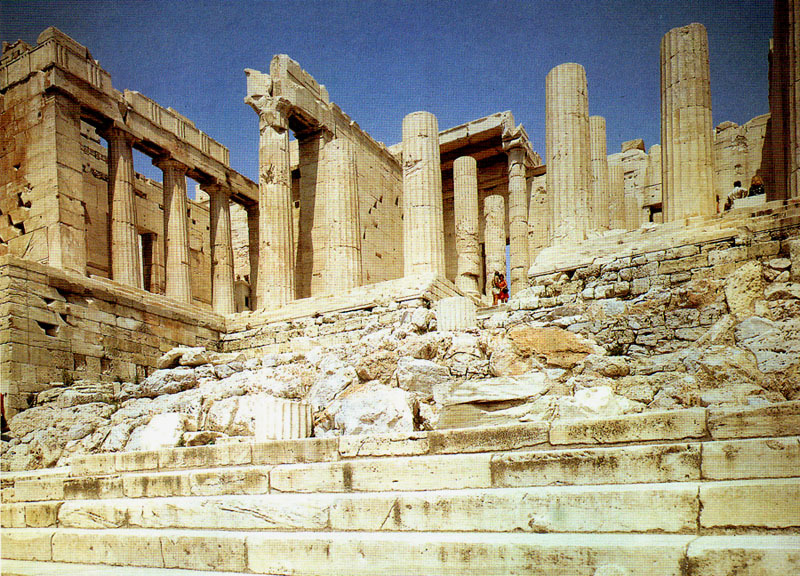 Again the entire structure was built of marble and included refinements comparable to those of the Parthenon. It is fascinating to see how the familiar elements of a Doric temple have been adapted to a totally different task, on an irregular and steeply rising site. Mnesicles has indeed acquitted himself nobly. His design not only fits the difficult terrain but also transforms it from a rough passage among rocks into a splendid overture to the sacred precinct on which it opens.